Alpha Math Learning is a local Glenview math tutor offering private instruction for students that are interested in sharpening their math skills. Alpha Math Learning is owned and operated by Mr. Patel. Mr. Patel is certified with the Illinois State Board of Education and American Tutoring Association. As a local tutor and private instructor in Glenview, Alpha Math Learning is familiar with the curriculum's adopted by all of the local school districts for all grade levels. We maintain working relationships with many teachers in the local school systems, as communication with private tutors such as our selves and our existing clientele's teachers, is welcome by the School District. Most parents realize the importance of providing a solid foundation for their child's education. This is why Alpha Math Learning offers local math tutoring programs in Glenview, IL 60026. We specialize in standardized test prep Math for ACT, PSAT, SAT; SAT-Math Level 1 and SAT-Math Level 2 subject tests and Algebra-I. If you are seeking a local home schooling instructor in Glenview, IL 60026 to assist your student in furthering their education and math skills, then we can help. Contact us today to discover our flexible and affordable math tutoring programs for students local to Glenview, IL 60026. In 2014, Business Insider ranked Glenview’s Glenbrook South High School as the 19th Best public high school in the United States. In 2015, Glenbrook School District 225 was ranked as the 2nd in the state only behind its neighbor New Trier Township, and 10th in the nation by Business Insider. Glenview Montessori school is a fully accredited, non-sectarian school of 2-6 year-olds and is part of the Deerfield Montessori Schools, one of the first Montessori schools established in Illinois. Public elementary schools and middle schools in Glenview primarily lie within the predominant K-8 district, known as Glenview School District 34, located in central Glenview, which operates six elementary schools (Glen Grove, Honking, Hoffman, Lyon, and Westbrook) and two middle schools (Attea and Springman). Public high schools are operated by Glenbrook High School District 225; most Glenview residents attend Glenbrook South High School. Portions of the village of Glenview who live on or east of Harms Road are served by New Trier Township High School District 203; students who reside there attend New Trier High School. Residents in the small portion of Glenview south of Central Road are part of Maine Township High School District 207, those who reside there attend Maine East High School. Private Schools include Our Lady of Perpetual Help and Saint Catherine Labouré. Both schools educate pre-K and K-8 students. Among the private schools, Glenview New Church Schools offers a Christian-based influence on its education. GNCS offers pre-K and K-8 as well as offering some part-time High School classes in MANC (Midwestern Academy of the New Church) program. 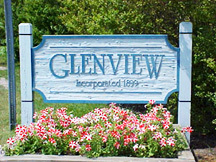 Residential Areas and School Districts include parts of Glenview within their boundaries.